For the first time since she escaped from her school many months ago, Eve can sleep soundly. She’s living in Califia, a haven for women, protected from the terrifying fate that awaits orphaned girls in The New America. Trapped inside the City walls, Eve uncovers a shocking secret about her past–and is forced to confront the harsh reality of her future. When she discovers Caleb is alive, Eve attempts to flee her prison so they can be together–but the consequences could be deadly. She must make a desperate choice to save the ones she loves . . . or risk losing Caleb forever. In this breathless sequel to “Eve,” Anna Carey returns to her tale of romance, adventure, and sacrifice in a world that is both wonderfully strange and chillingly familiar. Once picks up mere months after Eve ends. Eve, in Califia, still longs for Caleb, worrying over how he’s surviving, alone and wounded, out in the land. She still worries over Arden, whom she lost along their way. And yet, She herself is not safe in Califia and soon she’s gone from that hidden community, reunited with Arden, pulled apart from her again, reunited with Caleb, pulled apart from her again, going on and on through the twisting turning adventure of this book. What I loved most about Eve’s journey was how true to herself she stayed throughout it. She winds up in the City of Sand, in situations she could never have imagined and still she holds to her core beliefs, she doesn’t forget the needs of her friends or the other dissidents around the new America, and she’s always trying to do what’s right. The romance is definitely ratcheted up a level in this book. Everything’s still PG-13 but *fans self* there are some scenes with Eve and Caleb that are just…HOT! If you’ve read Eve, you know it ends with a huge cliffhanger!! When I read it, I was devastated and the only silver lining was that I had read it late and would be able to read Once in less than a year. With Once there’s still a cliffhanger, and a BIG one!! But this time I was thrilled by it! It’s not a good thing that’s happening but there are so many secrets revealed at the end of this book that I don’t care how long I have to wait for Rise, the final book in the Eve trilogy, I know it’s going to be an AMAZING read!!!! I FREAKING adored Eve’s journey in this book and I give it a magical 5 star rating! Adventure, romance; so many secrets revealed and still so much to learn in the next book make Once a MUST read! Tavia Gilbert returns as the narrator for this book and she does an amazing job! Her ability to portray all the characters makes this riveting book even more compelling! The audio version is superb! This is a series that I would love to start. Believe it or not my library system has them both, but they are in the system as new books, so no other library can snag them. 🙁 It sounds so good. Thanks for the awesome review. Yay I’m glad to hear that this series is worth reading! I know so many people either loved or hated Eve that I’ve been afraid to pick my copy up off my shelf and read it. I read and enjoyed Eve. I had a few slight problems with it but I do remember really liking it. I am excited to read Once and now I am even more excited than before! I am so glad that you enjoyed it and that you say the romance is even more than the first book. I can’t wait! Wow, such a great review and a 5 star rating! I didn’t like EVE that much and found it rather slow and wasn’t really into the love story. 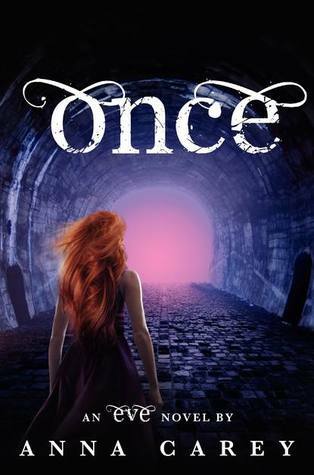 But your rave reveiw of ONCE makes me really think about picking up the sequel! I have had a copy of Eve sitting on my kindle for ages now! I think I’m definitely going to have to boost it up on my TBR pile. Once sounds great & I think it’s a romance I would quite enjoy. Thankyou for sharing your wonderful review! I had to go back and make sure that said PUSHY at the end of the review. I mean your reviews have been awesome but to be so excited about a cliffhanger ending and a PG13 romance? And not minding waiting for a year for the last book? I had to make sure it didn’t say Danny. I haven’t even started this series, but I might just wait for the last book to come out. I have the first one, but I’m not a patient person as far as cliffhangers. But you’ve definitely made me want to read the series. I’ll get Once when I have some extra money so I can get Rise when it comes out. Awesome review! Didn’t read the review, just looked at how many matroyshkas you gave it because I have the first book sitting in my to-read pile. I was just trying to decide what to read next and it just got moved to the top of the pile!